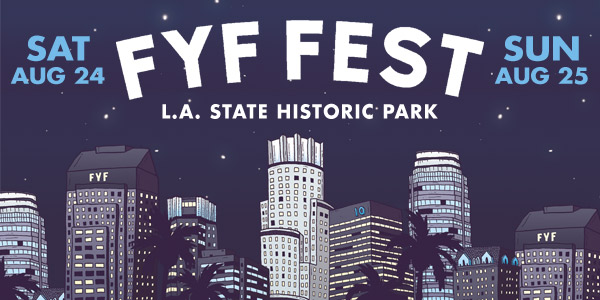 FYF Fest returns to the Los Angeles State Historic Park Saturday and Sunday, August 24-25. This year, FYF celebrates its 10th anniversary with an extra special lineup, featuring headlining performances by the Yeah Yeah Yeahs and My Bloody Valentine and scores of other great bands. Keith Morris – who will be performing with band FLAG at the festival – knows that Metro is the best way to get there. Check out his journey in the slideshow above as he tests the rails in preparation for the music festival. Not only is going Metro to FYF easy, it’ll get you some free swag. Show your TAP card at the Lost and Found near the entrance for a free bottle of water – hydration is important! – and get a free poster by presenting your TAP card at the merchandise booth near the entrance. Offers are limited to while supplies last, so don’t wait until it’s too late! The exclusive offer is part of Metro’s Destination Discounts program. Go Metro to participating locations and events and you’ll save on admission, get discounts on meals, and receive free gifts. FYF Fest takes place just one block north of the Gold Line Chinatown Station. For routes and connections, use Trip Planner. Metro has plenty of park and ride lots for those who want transit to help them go the rest of the way. There will also be secure bicycle parking for those who ride in on two wheels. Metro will be running enhanced service for FYF Fest, more details on that to come. This a great partnership! I luv FYF Fest and public transit will make this an interesting experience!!! he countdown is on: 9 more days!!! 🙂 Keith Morris does a great job in promoting public transit….it caught the eye of my bf…we cant wait!!! Oh yes!!! Can’t wait to go to FYF via Metro. Its going to be my first FYF. Its also gonna be my first time taking the train!! Nice post! I have not heard anything about it, but if he has Twitter/FB perhaps someone *coughcough* should suggest it to him!